On 26th Jan 2015, India celebrates the 66th Republic Day with joy and gaiety. While conveying the greetings to all the readers, we thought of sharing some interesting facts about the significance of this day for the benefit of our young members. After the prolonged struggle and negotiations, as a fore-runner of Independence, a 'Constituent Assembly' was formed with members representing different regions and religions. The first meeting of the Constituent Assembly was held on 9th December 1946. Many great leaders were part of this Assembly. On the first day, 207 members participated. On the first day, Acharya Kriplani, one of the respected leaders, started the proceedings invoking the 'divine blessings' and proposing the name of Shri Sachchidananda Sinha (Bihar), the eldest member of the Assembly as 'Provisional Chairman' till the Chairman was elected. Shri C. Rajagopalachari (Rajaji) was the first member to present the credentials and sign the register to become the member of the Constituent Assembly. On the third day, Dr Rajendra Prasad was elected as Chairman of the Constituent Assembly. The designation 'Chairman' was subsequently replaced as 'President of the Constituent Assembly'. 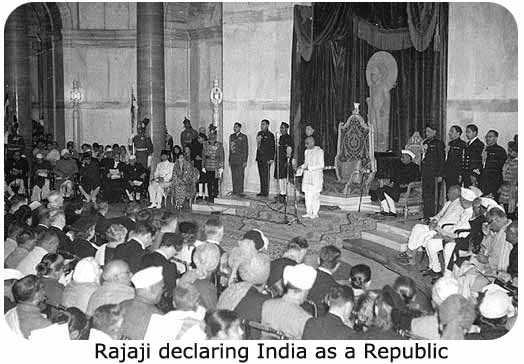 India attained freedom and Independence on 15th August 1947 and this Constituent Assembly took the Governance of India from the British Parliament. Lord Mountbatten was requested by the Constituent Assembly to continue as Governor General for some time. Shri C. Rajagopalachari (Rajaji) took over as the Governor General on 21st June 1948 and he continued till 26th Jan 1950. Rajaji was the first Indian Governor General of India. After 26th Jan 1950, the Governor General post was made as President of India. Dr. Rajendra Prasad become the first President of India. Framing Draft Constitution for India. After the Indian Independence, the Constituent Assembly wanted to frame the Constitution for India. 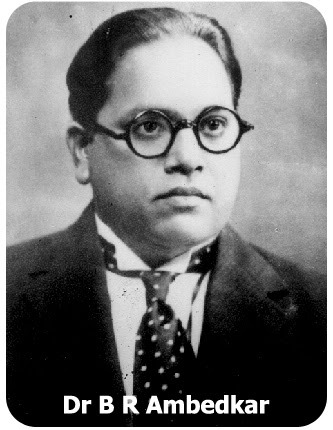 They constituted a 'Committee to draft the constitution' on 29th August 1947 with the Chairmanship of Dr B. R. Ambedkar. Shri Alladi Krishnaswamy Ayyar, Shri N. Gopalaswami Ayyangar, Shri K. M. Mushi, Shri Saiyid Mohd Saadulla, Shri B L Mitter and Shri D. P. Khaitan were included as other members of this Committee. These eminent people drafted the Indian Constitution and presented to the Constituent Assembly on 4th November 1947. The Constituent Assembly discussed this Draft Constitution in 114 sittings, spread over 2 years 11 months and 17 days thoroughly. The final Constitution was adopted by the Constituent Assembly on 26th November 1949. This day is also known as National Law Day. On 24th January 1950, 284 members of the Constituent Assembly signed the document and presented the official Constitution to the nation. Two hand-written copies of our Constitution (one in English and the other in Hindi), illuminated by artists and one print copy of English Version were signed by the members. After putting their signatures, all the members including Dr. Rajendra Prasad (President of India Elect) and other members sang Vandemataram and Jana Gana Mana in chorus, symbolising a great achievement of the Sovereign Independent Republic of India, after a struggle of nearly three centuries. This Constitution came into force on 26th Jan 1950. From that day, India is a Sovereign Independent Republic. When the new Constitution was signed by the members on 24th Jan 1950, it was drizzling outside the Parliament at Delhi. It was considered by them as a good omen. 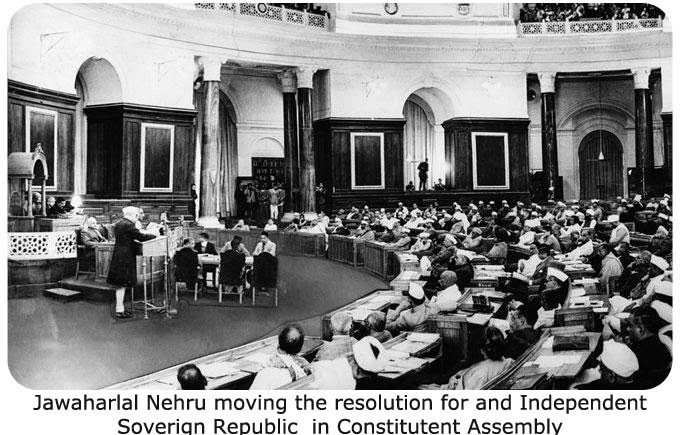 This Constitutent Assembly was made a 'Provisional Indian Parliament' from 26th Jan 1950. The first General Election was held in 1952 and the 1st Lok Sabha was constituted. 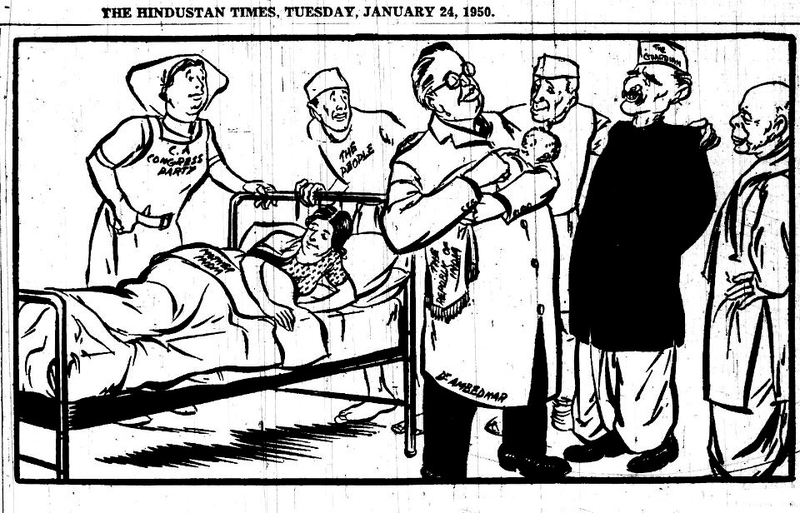 This cartoon was published by Hindustan Times on 24th January 1950, two days before the first Indian Republic Day. This cartoon was drawn by the popular cartoonist Enver Ahmed. In this cartoon, Mother India gives birth to a baby called 'The Republic of India' and the DOCTOR Ambedkar holds the baby in his hands and gives a gentle touch. Congress Party is depicted as Nurse. The people of India, Jawaharlal Nehru, Dr Rajendra Prasad and Sardar Vallabhai Patel are looking at the new born baby with great anxiety. The Indian Constitution, drafted by great visionaries, continues to be one of the best constitutions in the world. Many global legal experts have praised our constitution. 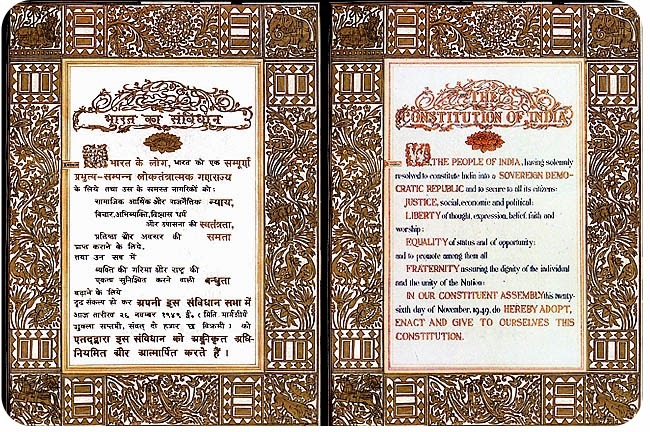 The Indian Constitution contains 22 parts, 395 articles, 12 schedules and 2 appendices. Over a period of 66 years, the Constitution has undergone 99 amendments. The last amendment being the formation of National Judicial appointments Commission. We are publishing the finer details for the benefit of all the youngsters. The freedom and soverignity we enjoy did not come on a single day. Our elders have struggled and lost their lives in the freedom movement spread over nearly 300 years. The great visionary leaders have also provided us a great Constitution. None of these leaders, who had signed the constitution is alive today. It is the responsiblity of every one of us to salute our great leaders and freedom fighters on this day and live upto their vision.